This summer, Marist College junior Allison (Alli) Long reached out to Impact PR & Communications for a fall internship. Alli immediately stood out from the pack of applicants. A few things caught our attention. First, she’s a professional writing major (with a minor in public relations and biology) and our team is passionate about the importance of writing skills. We’re talking super passionate! Next, Alli took the time to send a personal note. She mentioned how she’d heard our firm’s founder, Filomena, speak before a PR class she took the previous semester at Marist and how she was eager to combine her love of writing with her interest in PR. She took the time to get to know what we did and what kinds of clients we did it with and that made all the difference. Before Alli says “Arrivederci!” to all of us and takes off for Florence, where she’ll study abroad for the spring, we wanted to ask her a few quick questions so that she could pass along what she learned to others looking to enter the field of communications. Alli, what drew you to an internship with us? I have always loved to write, but wasn’t sure how I could turn something that was more of a hobby into a profession. I decided to take an introductory PR class in the spring of my sophomore year at Marist, and my professor invited Filomena (Impact’s founder) in to speak with our class about the PR field. Everything that Filomena talked about was interesting to me, and I realized that the PR field could be a great fit for me! What drew me to Impact specifically was Filomena’s excitement and energy when she was talking to our class––I thought Filomena was so cool and smart, so I decided to email her and inquire about a potential internship position. What’s your best tip for someone preparing for an interview with a PR agency? Definitely do your research––which I think goes for any job interview––but especially for PR. Know the firm’s clients and show an interest in them, because if you get the job, you’ll be working with them! I think it’s important to show that you cared enough to do research on the company beforehand and are ready and excited to work with the clients they have, since working with clients is the basis of the company’s day-to-day functions. What was your favorite thing to do at your internship? I enjoyed doing a lot of things at my internship, from writing press releases to creating graphics here and there. I think my favorite thing was creating social media calendars for clients, it allowed me to be both creative and strategic, plus it was fun! Is there anything that surprised you about the day-to-day of working in public relations? I think what surprised me the most is how much goes into being successful in PR. It’s not just writing good press releases and pitches––it’s having great relationships with the media, being extremely organized, running from client meetings to client events, and working as part of a team. 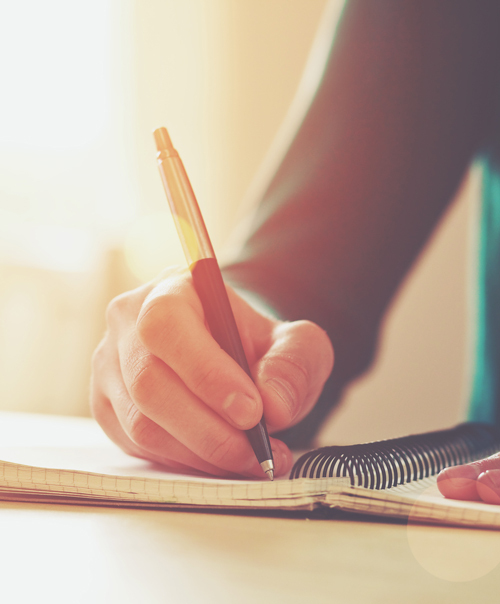 Writing is a large and important part of the job, but it’s not the only part! 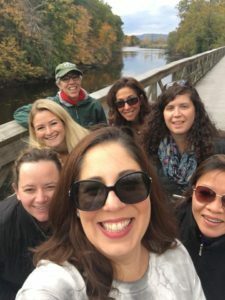 I’ve learned from Filomena, Nikki, Michelle, and Karen that teamwork is probably the most important aspect, whether it be teamwork within Impact, with a client, or with the media. What hashtag would you use to describe your internship? #Inspired…I couldn’t have asked for better mentors or a better internship, and I know the “impact” Filomena and the team has made on me will last a very long time. 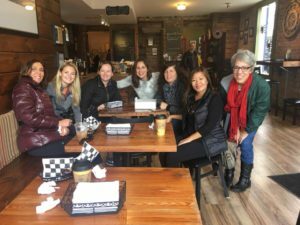 Thanks for sharing with us, Alli, and here’s a photo for all of you reading, from our last team outing, when Alli joined us in Beacon, New York for a delightful nature walk, delicious lunch and decadent donuts.